The Fall raptor migration has already started again this year and I recently had the opportunity to share these amazing birds with a group of people interested in learning more about them. 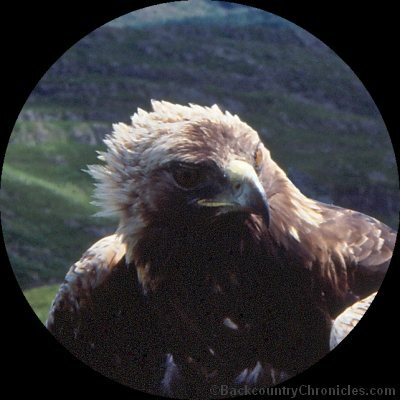 Since I have studied migrating raptors since the late 1970s, I have spent much of my life observing birds and wildlife with both binoculars and spotting scopes and have literally peered through binoculars from sunrise to sunset for weeks at a time. At the “hawk watch”, we mainly used binoculars to watch raptors as they surfed towards us as the wind swept up the side of the mountain. Occasionally a hawk or golden eagle would perch nearby where we could get a closer look with spotting scopes. We also use the spotting scopes to get a better view of mountain goats that were feeding high up on the mountain. Most of the people were beginners at watching raptors, so they were also beginners at using binoculars and spotting scopes. They found it very difficult to locate the moving raptors with binoculars, let alone attempt to identify them. It takes practice to be able to quickly find and focus on raptors with binoculars, especially at great distances where the birds are just tiny specks, but also when they are very close and moving quickly. 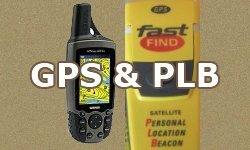 It is fairly simple to focus on large animals that are at a distance after we find them. We located and focused the spotting scopes on perch raptors and on the mountain goats so people could see them. Obviously, each person needs to adjust the spotting scope for their eyes with the fine focus, but there are always people that have more trouble than others at finding the best focus, especially in low light, high power or at great distances. This can be because their eyes do not focus or it could be they are straining the limits of their particular binoculars or spotting scope. But there is a simple trick that you can use to see more detail. Roll the focus knob slightly back and forth so you alternate between focusing on the front of the target and the back of the target. Your eye (actually your brain) will pickup minute details as the focus slowly changes with the adjustment. This technique is often more useful than staring for a long time at an image that you can’t seem to pull into clear focus with your eyes. If at first it doesn’t seem to help, but don’t give up, like most things, this also takes practice. As an example, if you were looking at a red-tailed hawk with it’s back toward you. You should be able to see the red-tail if the bird is an adult, but the color can be hard to see in low light especially if it is very small in the field of view. The next character you could look for would be the white “V” formed by the light colored scapulars, which can also hard to see in low light. By rolling the focus knob back and forth, you may be able to identify one of these characters that you could not see if the focus remained fixed. 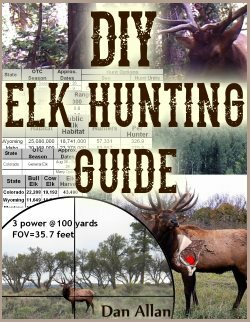 I’ve also used this technique while watching elk at over 3,000 yards. It was easy to see and identify the animals as elk, especially those in the sunlight, but it was difficult to see if any of the elk in the shadows had antlers. By rolling the focus knob slowly back and forth, I was able to tell that there were several mature bulls and at least one spike bull with the herd. Obviously, you will need to use this technique less if have good optics, but it will still help to discriminate small details. Beginning binocular and scope users also have a tendency to use binoculars (if variable power) and scopes on the highest power. But bigger is not always better. 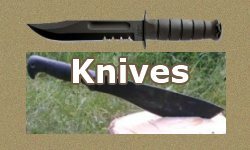 High power, especially on less expensive optics immediately decreased the level of light. The image may be larger, but it will also be fuzzier and darker. I suspect that many that complain about unclear images (especially at high magnification or low light) need corrective lenses. Several of the people that we tried to help view raptors and mountain goats recently claimed they could not focus clearly on them. In low light conditions, the ability of our eyes to focus starts to come into play more than in bright light. In bright light, our pupils constrict, which forces most of the light rays to enter the eye almost completely parallel, which helps focus the image on the retina. In low light conditions, our pupils dilate which allows light rays to enter the eye that are at an angle, which can cause an unfocused image. Test yourself by using the old pinhole glasses trick. Look at something like a digital clock from across a dark room. If you can’t see it clearly, make a pin-hole in a piece of paper or create a small hole between your two index fingers and thumbs and look at the clock again with one eye at a time. If the image becomes clear after looking through the hole, that proves your eyes need a little help focusing. I wear glasses most of the time when using binoculars and spotting scope because I see more clearly. I can take them off and using the focus adjustment can see fairly well in bright light and at low power, but not so well in low light, and especially not well at low light and at high power. If you need glasses, take it like a man! (or woman). It happens to the best of us. Why would anyone not want to see as well as they possibly could? 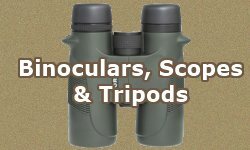 If you need a spotting scope or binoculars as a tool to enjoy watching birds and wildlife or for hunting, you don’t have to start with the most expensive. Years ago, I invited some “high powered birders” came to my hawk-trapping blind. They both had very nice and very expensive Swarovski and Zeiss binoculars. I was still a starving graduate student, so I was using a very cheap pair of binoculars. They tried to convince me they saw a Ferruginous Hawk soaring in the distance, but I thought the bird was a light colored red-tailed hawk. They finally asked me to look at the bird with the Swarovski binoculars as if I could see the bird more clearly with a good pair of binoculars, I would agree with them. I did look at the bird with the Swarovskis and Wow! that was a very sharp and bright image. But the bird was still a red-tail. After a few more minutes, the bird came closer and they conceded it was a red-tail after all. Experience and technique over technology (as old age and treachery beats youth and enthusiasm). I am able to afford better quality optic now, but I still don’t use expensive binoculars or spotting scope. 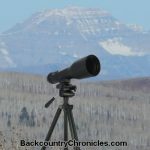 Read my reviews on my Vortex Diamondback Binoculars and Nikon Prostaff Compact Spotting Scope. 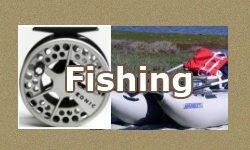 What is the difference between the 2015 model and 2016 model Vortex Diamondback binoculars? Vortex redesigned the Diamondback binocular line for 2016. 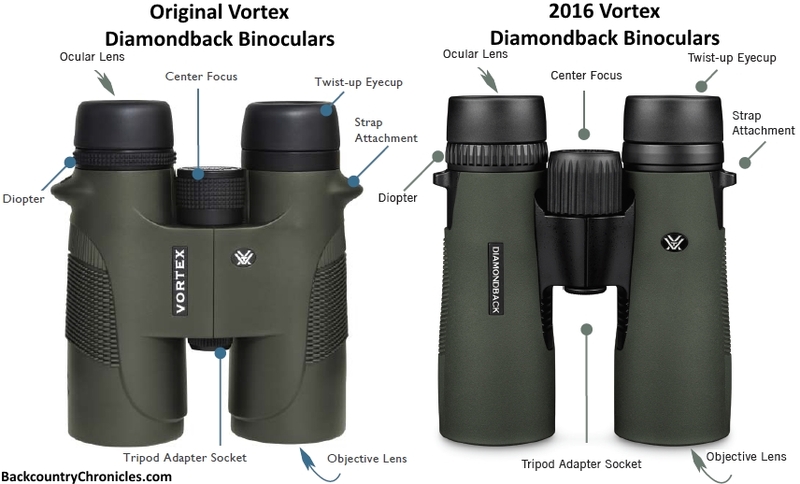 (See photo comparing the original Vortex Diamondback binoculars with the new 2016 Diamondback model). The main thing you will notice is the shortened hinge design leaves more room for your hands. The new Diamondbacks also have an all new optical system and dielectric fully multi-coated lenses.